PS Duchess of Hamilton chock-a-block full at a Royal Northern YC Regatta, Rothesay, July 1898. During the 1890s and early 1900s heyday of the Clyde Fortnight regattas, the Caledonian Steam Packet Company’s elegant paddle steamer, Duchess of Hamilton – launched this day in history, 1890 by William Denny & Bros, Dumbarton – was a popular and regular ‘Club Steamer’. For a regatta day, she would eschew ferrying trippers across the Firth of Clyde to be instead at the disposal of the organising club’s members; those unfortunate enough not to have their own steam yacht. We’re not sure at the moment if this was totally exclusive, but if the photo above is anything to go by, one imagines it was a profitable matter. Yet, as sport and leisure historian Matthew L. McDowell explains in a fascinating paper on the 1890s Clyde steamer opulence wars, the drive to be seen to be offering increasingly high catering standards sent margins into the red. Sometimes it’s better not to know that kind of stuff, and revel instead in the Victorian positiveness of it all. Which is most probably what the local Board of Trade inspector thought too; anyway, the Titanic disaster was fourteen years in the future. The Duchess of Hamilton was one of a multitude of dashingly elegant paddle and subsequently also turbine powered vessels that helped to make the Firth of Clyde what it is today. Their demise, on the rise of affordable motor cars through the 1950s, and cheap package holidays abroad from the 1960s, left many of the communities of genteel riparian villas they helped to develop – a kind of maritime, summertime suburbia – subsequently rather isolated. The sole reminder of those heady days is the last of the Clyde paddle steamers, the Waverley, launched in 1947 at the Pointhouse shipyard of A. & J, Inglis, now the site of the spectacular Zaha Hadid designed Riverside Museum, and earlier the shipyard where G.L. Watson served the second phase of his indenture in naval architecture under the mentorship of Dr John Inglis. Waverley’s engine space (above) and her original triple expansion steam engine, built by Rankin and Blackmore of Greenock, has mesmerised this lad – and overgrown lad – from its viewing gallery for over fifty years. During the production of Martin Black’s biography G.L. 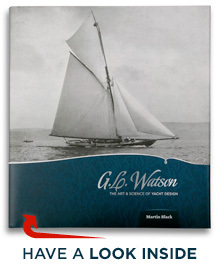 Watson – The Art and Science of Yacht Design, we were painstaking in our desire to give place and time to the wonderful images at our disposal, and amazed at how little more much of the Firth of Clyde had been developed since the 1890s. This award-winning book – exceptional in quality both for its contents and production value – is available to purchase online here, or from the growing list of worldwide stockists here. This entry was posted in book, Clydebuilt, film, Firth of Clyde, G.L. Watson, gift, Glasgow, Martin Black, object of desire, River Clyde, shipbuilding, shipyards, Steam Yacht, yacht design and tagged A. & J. Inglis, Caledonian Steam Packet Company, Club Steamer, Clyde Fortnight, Dr John Inglis, Duchess of Hamilton, paddle steamer, Pointhouse, Riverside Museum, Royal Northern YC, Waverley, William Denny & Bros., Zaha Hadid. Bookmark the permalink.